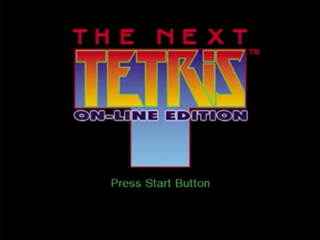 The Next Tetris: On-Line Edition is an entry in the Tetris series of games. It was developed by Blue Planet Software and published by Crave for the Sega Dreamcast in 2000. It is online enabled version of a game that was released on other platforms. A leaderboard is available which shows the highest scoring individuals in the region. The Online portion of the game is still online via Private Servers and can be used with the DreamPi. Unlike games before it the blocks are made up of polygons. As usual with other Tetris games, variously shaped blocks must be lined up to make complete lines at which point the complete line of blocks will be cleared off the screen. Two Modes are available: The Next Tetris and Tetris Classic. Tetris Classic is one player only and only The Next Tetris is On-line enabled. In the Next Tetris Mode One Player, Two Player, and Marathon, and Practice modes are available. The Next Tetris was originally released for the PlayStation and Windows PCs in 1999, and while one might assume On-Line Edition simply adds online play, the Dreamcast game overhauls all of the presentation and visuals. The core gameplay remains the same however, and all of the modes included in the earlier game are also seen in On-Line Edition. Likewise, the two versions share a soundtrack. Main article: The Next Tetris: On-Line Edition/Magazine articles.